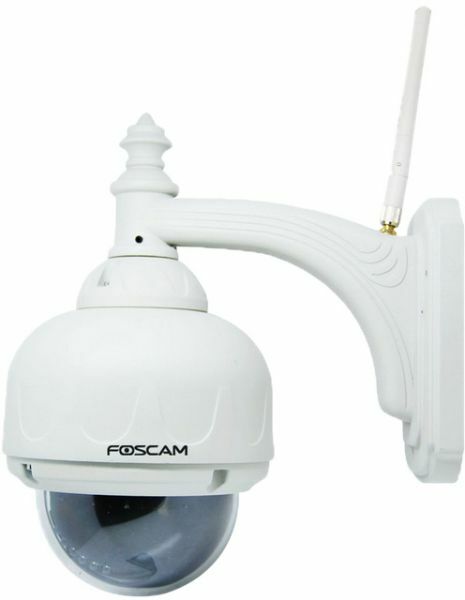 The Foscam FI8919W features video, pan/tilt, remote internet viewing, motion detection, as well as a built in network video recording system. In addition, it is smartphone compatible (iPhone, Android & Blackberry) as well as viewable over the internet using standard browsers. The camera functions well as part of a home or office security system with remote internet monitoring ability. Wireless Pan/Tilt Outdoor IP camera. Includes Lifetime Telephone, Email & Remote Desktop Support by Foscam Digital Tech. 355 degree pan, 75 degree tilt. Includes Foscam Cloud Free Trial for Cloud Video Storage & Playback. Average outdoor IP camera for outdoor use. Good night vision.